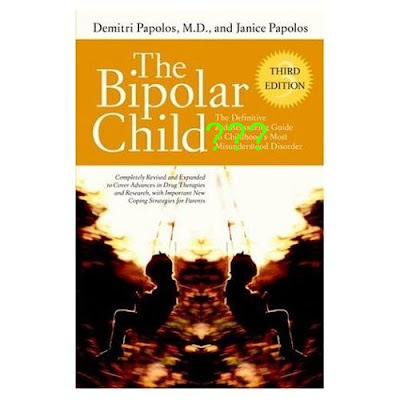 BP-NOS: In the February 2007 issue of the Journal of the American Academy of Child and Adolescent Psychiatry is a study where the demon of bipolar disorder not otherwise specified (bipolar NOS) rears its ugly head. Check this out. *plus two of the following symptoms (three if irritated mood only) that were "clearly associated with the onset of abnormal mood"
*The above symptoms must have been associated with "clear change in functioning"
*"A minimum of 4 days (not necessarily consecutive) meeting the mood, symptom, duration and functional change criteria over the subject's lifetime, which could be two 2-day episodes, four 1-day episodes, and so forth." What This Means: Suppose little Johnny (age 9) is throwing tantrums, beating on his little sister, and generally being a behavior problem. In addition, he thinks he is really important (inflated self-esteem), not sleeping much, talks pretty fast, has a hard time keeping on one subject when speaking, is distractible, engages in an "excessive" amount of physical play, and engages in some higher risk play activities. During these times, Johnny annoys his parents, other kids, and his teachers. Some combination of the behaviors listed above generally occur for four to six hours at a time, except that his sleep is poor at times for a couple days at a time. Suppose he's had a total of 6 days in his life when this type of behavior has occurred. Well, according to some researchers, it is clear that lil' Johnny has bipolar disorder NOS, though it seems to me like he's just a nine year old whose behavior could at times be better, as is the case with most boys his age. If Kids Have Bipolar Disorder: Of course, the upshot to a bipolar diagnosis is that it requires treatment, so should we really be breaking out Zyprexa, Depakote, or Risperdal for Johnny? As the diagnostic criteria become increasingly liberal, medication will be dispensed more frequently to those who need it less or not at all. Yet this passes for scientific progress in some circles. Kids who are now "bipolar" were labeled as having conduct disorder and/or ADHD (or were not given a label -- God forbid!) a few years ago, but the bipolar child/adolescent paradigm is now sweeping across parts of the nation despite the rather meager data that this disorder exists to any meaningful degree or that treatment yields much benefit, especially in the longer-term. Do Kids Have Bipolar Disorder? In some cases, I think they do, especially in adolescence. But we are absolutely kidding ourselves by labeling every moody kid with an occasional behavior problem as "bipolar". It is this kind of diagnosis-extension program that leads many people to claim that psychiatry cares more about expanding market share than anything else. For a great read on this topic, please read Intueri's earlier post. Also feel free to read my earlier post about incredulous statements made regarding bipolar children. This is truly scary stuff. I'm appalled that there are quack psychiatrists out there who would seek to label kids as dysfunctional, just for behaving like kids!! Great stuff, keep it up!! Thanks Giles. I'm sure most of these "Bipolar Child" phenomenon-backing docs have good intentions, but either I'm in need of a straitjacket or their ideas about bipolar have run far beyond what can be considered reasonable. I'd be interested to see any case studies involving 7-year-olds who have indulged in unrestrained buying sprees, sexual indiscretions, or foolish business investments. PTSD. But don't get me started on this one!!! CL Psych--Got ya linked up on my blog for this post. It might be interesting for your readers to see how my daughter's bp dx came to pass w/out behavior issues as a baseline. Behavior issues started after the medication nightmare. PTSD? yep, she's now got that label as well, due to her year long hospital stay that came up with Impulse Control Disorder as a standing dx w/discharge on Clozaril and Lithium. Psychiatrists, and psych wards all have one purpose, and goal: medicate, medicate, medicate. Thanks for the kind comments Stephany and thanks to everyone for your comments. Apparently I'm not alone in thinking that this bipolar in kids fad smells quite fishy. Just so you know this and all the other posts you've had on childhood "bipolar disorder" is moving me very much. I have a post in the works linking to your site as a resource on this topic. What is truly disturbing to me is that all these children, being diagnosed for no clearly apparent reason run the risk of becoming life-long patients and drug consumers. It makes me cry to think of so many lives destroyed. I've seen the destruction that a life-time worth of medication results in. Both as a social worker in mental health, as well as a victim of over-diagnosis and over-medication. Keep up the excellent reporting on this very important topic. 1.Stop the habit of watching the clock, counting the hours and remembering the hours as it leads to lack of sleep. 2.For a restful sleep, put a pillow under the knees to relieve lower back pressure. 3.Some people may not like taking warm bath; they can soak their feet in warm water for fifteen to twenty minutes before going to bed. Apply oil and massage each foot before going to sleep. 4.If feeling of tiredness leads to sleepiness during the evening, try to resist going to bed early than usual time.